We just returned from a long weekend in San Francisco. Living out in the Sierra Foothills as we do, we enjoyed many city activities not available here. We spent a lot of time in the Golden Gate Park and its museums. We went to Ocean Beach. And we enjoyed eating out at different styles of restaurants. We were surprised that San Francisco restaurants still automatically put water out for every person. Given the extreme drought California is experiencing, we thought there would have been more awareness about not wasting water. In San Francisco, or any other place with a water supplier (not your own well), you can check what is in your water by looking up “San Francisco (or your town) Annual Water Quality Report” on the web. Open the site from your local water supplier, not a national site. To select the right filters if you are on a municipal system, all that we need to know from the annual report is if the water has fluoride – and if the disinfectant used is chlorine or chloramine. It’s not hard to read: Is fluoride listed as present? And is chlorine or chloramine listed? That’s what you need to know to get the right filters. All our kitchen filters and whole house filters are designed to filter the rest of what might be in your water. 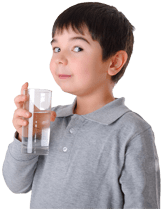 But fluoride and chloramine require specific filter material you don’t otherwise need. You can bring a filtering water bottle to the restaurant. It might not be as elegant, but it will preserve your health.